1. 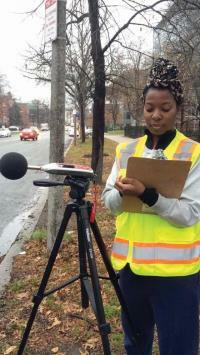 *PHScience*: Researcher, Erica Walker has been biking around Boston, recording sounds, then documenting them to later build a noise model. A doctoral candidate in Environmental Epidemiology, the 36-year-old Walker, a Mississippi native who lives in Brookline, started thinking about the impact of community noise about six years ago, thanks to the clatter engendered by the children who were living in the apartment above her. Here is a list of sounds that she is documenting, and I added a few of my own. Thinking realistically and honestly, what sounds do you think have the potential to hurt your health? 2. Do you think that the point of intersection, where moving on hurts your health, is whether or not you can used to certain noise, you are not auditory, it's a matter of attitude? 3. I am not sure when Erica will be done with her research, and her dissertation, but how interested are you in her work and reading her final results as well as the noise model?